This Product Guide describes withdrawn models of the Lenovo System x3650 M5 (Machine Type 8871) with the Intel Xeon processor E5-2600 v4 and E5-2600 v3 product families. For withdrawn models of the Lenovo System x3650 M5 (Machine Type 5462) with the Intel Xeon processor E5-2600 v3 product family, see the following Product Guide: Lenovo System x3650 M5 (Machine Type 5462). The System x3650 M5 (8871) server models described in this product guide are withdrawn and no longer available for ordering. Improves productivity by offering superior system performance with the Intel Xeon processor E5-2600 v4 product family with up to 22-core processors, up to 55 MB of L3 cache, up to 2400 MHz memory speeds, and up to 9.6 GT/s QPI interconnect links. Flexible and scalable internal storage configurations provide up to 215 TB of storage capacity with 7.68 TB 2.5-inch solid-state drives (SSDs) in a 2U rack form factor. 1x VGA port (optional for all models). Service and support Optional service upgrades are available through Lenovo Services: 4-hour or 2-hour response time, 6-hour or 24-hour fix time, 1-year or 2-year warranty extension, software support for System x hardware and some System x third-party applications. Note: Standard models of the x3650 M5 (E5-2600 v4) are not available in North America. *** Processor details: Processor quantity and model, cores, core speed, cache, memory speed, and thermal design power (TDP). * This model includes the SD Media Adapter with two blank SD cards (00ML706), PCIe Riser 1 (2 x8 FH/FL + 1 x8 FH/HL Slots) (00KA498), and IMM Advanced Upgrade (90Y3901). ^^ An optional LCD display is included in the optional Front IO Cage Advanced (00YD002). ~ This model includes the dual-rotor fan base, SD Media Adapter with two blank SD cards (00ML706), PCIe Riser 1 (1 x16 FH/FL + 1 x8 FH/HL Slots) (00KA489), and IMM Advanced Upgrade (90Y3901). The System x3650 M5 supports up to two processors of the Intel Xeon processor E5-2600 v4 product family. Also, support for the Intel Xeon processor E5-2600 v3 product family is available via CTO only. The following tables list the specifications of the processors for the System x3650 M5. ** NVMe PCIe SSDs support informed hot removal and hot insertion, provided the operating system supports PCIe SSD hot-swap. The following table lists additional supported Ethernet network adapters, transceivers, and cables. ‡ Slot 3 is supported only with the PCIe x16 Riser 1 (feature code A5FN). 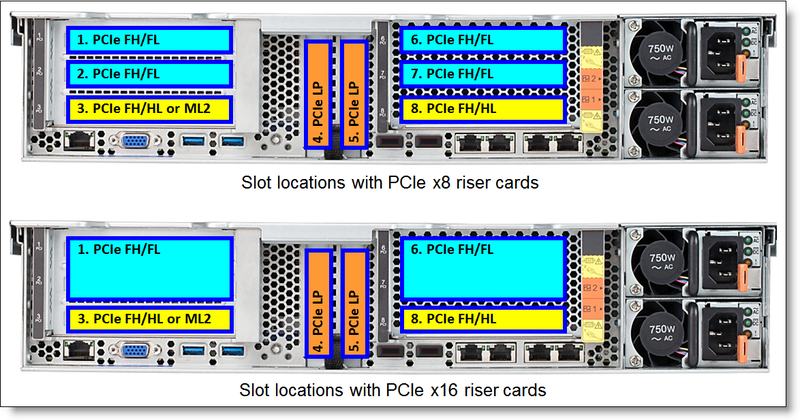 Slot 8 is supported only with the PCIe x16 Riser 2 (feature code A5R5). § Not supported with the Intel Xeon processor E5-2600 v3 product family. Unless otherwise specified in the table footnote for the specific adapter, PCIe x4 and x8 Low Profile network adapters are supported in the low profile PCIe x8 slots on the system board and full-high PCIe x8 and x16 slots supplied by the riser cards 1 and 2. PCIe x8 full-height network adapters are supported in the full-height PCIe x8 and x16 slots supplied by the riser cards 1 and 2. PCIe x16 Low Profile network adapters are supported in the full-height PCIe x16 slots supplied by the riser cards 1 and 2. ‡ Slot 3 is supported only with the PCIe x16 Riser 1 (feature code A5FN). 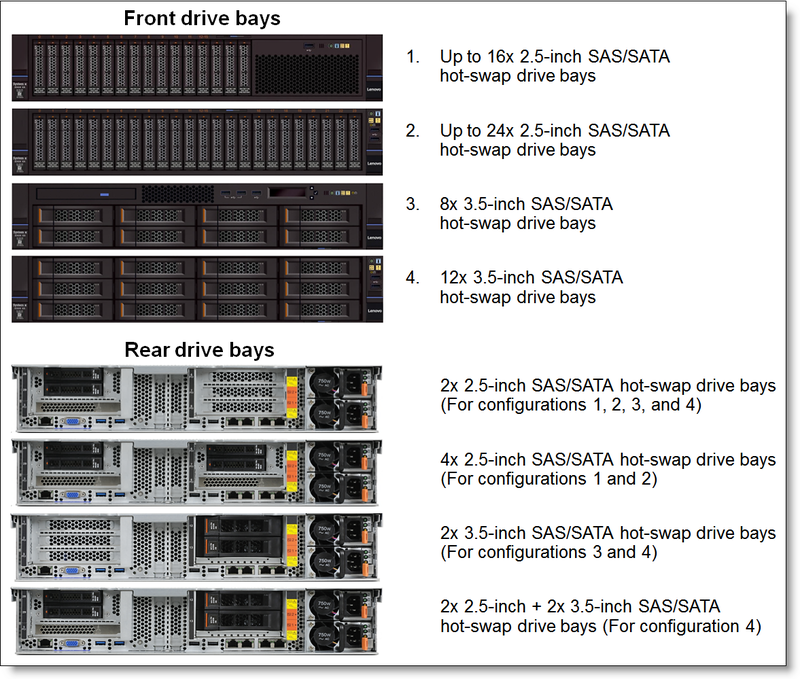 Configuration note: Unless otherwise specified in the table footnote for the specific adapter, SAS RAID controllers and HBAs are supported in low profile PCIe x8 slots on the system board and full-high PCIe x8 and x16 slots supplied by the riser cards 1 and 2. *** Not supported with the Intel Xeon processor E5-2600 v3 product family. The GPU adapters are supported only in the environments with the air temperature of up to 35 °C (95 °F). Passively cooled GPU adapters (part numbers 7C57A02891, 7C57A02888, and 7X67A00068) require the dual-rotor fans (included in a dual-rotor fan CTO base or in the optional x3650 M5 Dual Rotor Fan Thermal Kit [part number 00YD003]) and the optional x3650 M5 Passive GPU Thermal Kit (part number 01GV396). redundancy, and each system fan has one or two rotors depending on the model. System x3650 M5 servers with single-rotor fans can be upgraded to dual-rotor fan systems by replacing the existing single-rotor fans and cage with the dual-rotor fans and cage by using the optional Dual Rotor Fan Thermal Kit (part number 00YD003). Single rotor fan-based server models of the System x3650 M5 with one processor include four system fans, and server models with two processors include six system fans. 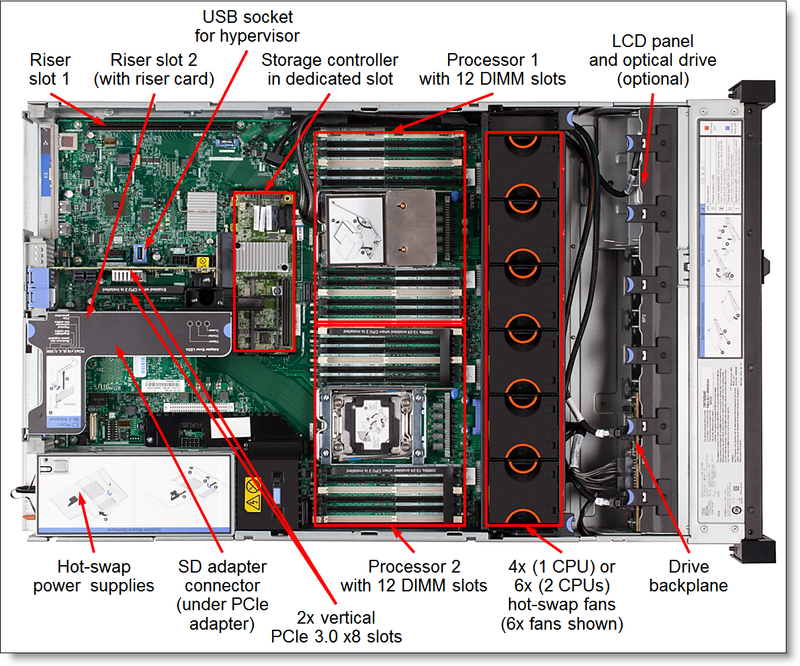 Dual-rotor fan server models of the System x3650 M5 include six system fans. The PCIe thermal solution kit (part number 00MU908) is required if any of the ML2 adapters are present in the configuration. The PCIe thermal kit contains an air baffle. The Passive GPU Thermal Kit (part number 01GV396) is required when passively cooled GPU adapters (part numbers 7C57A02891, 7C57A02888, and 7X67A00068) are present in the configuration. The Passive GPU Thermal Kit contains an air duct, two low-profile heatsinks, four GPU power cables, and a full-length card holder. The Dual Rotor Fan Thermal Kit (part number 00YD003) is required for single-rotor fan server models of the System x3650 M5 when passively cooled GPU adapters (part numbers 7C57A02891, 7C57A02888, and 7X67A00068) are present in the configuration. The Dual Rotor Fan Thermal Kit contains six dual-rotor fans and a fan cage. The System x3650 M5 servers ship standard with or without a power cord (model dependent). The 900 W AC power supply option ships with one 2.8m, 13A/125V-10A/250V, IEC 320-C13 to C14 rack power cable (feature code 6400), and the other hot-swap AC power supply options ship standard with one 2.8m, 10A/100-250V, IEC 320-C13 to C14 rack power cable (feature code 6311). Configuration note: If the 900 W AC power supplies (00FK936) in the System x3650 M5 server are connected to a low-voltage power source (100 - 125 V), the only supported power cables are those that are rated above 10A; cables that are rated at 10A are not supported. The following table lists the security options that are available for the System x3650 M5 server.